Travel Bali on a Budget | A couple trip, no travel guide but Bali adventure! Hi there, how you doing? If you read my last post on beach holiday essentials, then you know I and husband went to Bali, Indonesia. We just came back after spending a whole week there. Beach holidays are always the best getaway from busy life. I’m obviously refreshed and more inspired to concentrate on work. But before everything I want to share our 7 days 8 nights couple trip (not a travel guide but our Bali adventure) with you guys. While traveling Bali on a budget yet having all the fun was the most exciting part of this trip. We wanted to visit Bali 2 years back but this year finally got time to escape. First of all, we took Malaysian Airways, found that they’re cheaper than any other domestic airlines, for example, Air Asia. Bigger jet, cheap freight, no headache of luggage weight and so Malaysian Airlines it is. We did book our hotel via booking.com in Nusa Dua for 7 days and 8 nights (approx 700,0000) but I don’t want to talk about that because I hated their service and food. We choose the hotel because of the sea view but it wasn’t the way we expected either. We also pre-booked a car (Toyota Agya, airport pickup, and drop) for the whole time (for 1300,000IDR) to avoid all the taxi hassle. And who needs a travel guide when Google Boss is there. We realized over the time, hiring a car was the best decision of this trip, thus we were able to roam around the whole city with an ease. We choose to stay in Nusa Dua because the area is less crowdy and not far from the beaches. Driving in Bali felt a bit critical to my husband because of the busy traffic, motorbikes all around and narrow roads but he got used to after a while. Bali is an island so it is unnecessary to say that sea is everywhere. A week is definitely not enough to explore the whole island. From 9 am to 7 pm every day we kept exploring. We didn’t spend much time on the most popular beaches like Kuta or Seminyak beach because those were over crowdy, we could hardly breathe there… phew! Other than that we used very wisely each and every precious minute of our stay in Bali. Let me give you highlights of Bali attractions. Some are simply breathtaking and some are just over-hyped by people. Alert, it’s about to be picture heavy! This is one of the most popular tourist attraction in Bali. The way to get into the temple only arises in low tide so you must visit there at low tide. However, you actually won’t be able to get into the temple or even go up. If you only wash your face with the Holy Spring water (and give a donation) then they’ll allow you to climb two steps of the stairs that are on the side of the temple. We did wash our faces and thought there we will get some better view but no, it’s nothing there actually. Nevertheless, the view of whole Tanah Lot area is beautiful! If you visit Bali you must visit this waterfall. It’s in Ubud, just an hour drive from Kuta. The waterfall is huge and powerful, water is super chilling. Mount Batur, the sleeping volcano is very popular to adventurous people for tracking. We are not that adventurous so we stayed with the view only. There is also a natural hot spring down in the base of Mount Batur. We were very excited to visit the spring, however, we came back disappointed. There are a few companies that operate the area. They actually made a few little pools and runs the spring water into the pool. You can bathe in the warm water there with safety. But the feeling of getting into the actual spring is far away from that. Moreover, entry fees to there are 1500,000IDR each. Within this one place, Water Blow, there are two things to enjoy. One is how the big wave crashes on the rocks and on the other side there is a nice golden beach. On the beach, you can just lounge with a coconut or can get playing with your surfboard and high wave. If you get here in the time of low tide you’ll enjoy the view most. In low tide, all fisherman gets into the seashore to catch fishes. There are a few nice restaurants by the beach, you can have your lunch while enjoying the view and wind blow. This is the beach just in front of the most popular Mulia resort. Before visiting Bali picture of the Mulia resort and the white beach caught my eye. Needless to mention, Mulia is expensive to stay but I didn’t want to miss the beach. But when we got there the beach did disappoint me. It’s not white by any means (as you can see in the picture) and quite dirty as well. Can you see the surfing people? The scary stairs to go the beach! This beach was our favorite of all, so blue, so clear, less crowd and one of the best places for surfing. There you’ll need to climb down a bit to reach the sea level. If you don’t surf and stay at the shore level you might get lucky and meet some sea snakes (I did), coral base and small fishes will mesmerize you without diving underwater. Both of these beaches are amazing, crystal clear water, high waves, and with less crowd. People go there to surf. However, to reach the shore of both you’ll need to climb down pretty high. Where Nyang Nyang beach doesn’t even have any proper stairs to climb down. 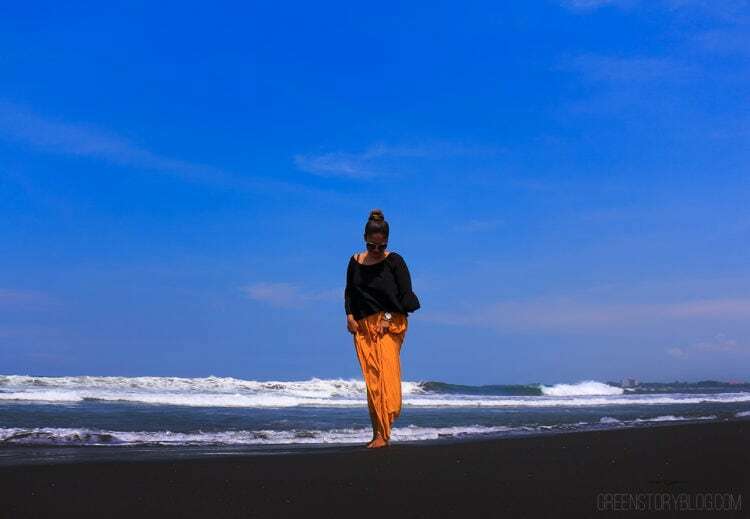 Did you know that there is a black sand beach in Bali just within the town? I didn’t! There is also another one called Lovina Beach which is far from the town, almost in the other part of the island. We kind of accidentally found this black sand beach. This beach literally made my Bali adventure fulfilled! It’s in the Sanur area, we were looking for Sanur fishing bay and found this one. The beach doesn’t come on the tourist list, it felt kinda abandoned but trust me it is exotic. I’ve never seen any black sand beach before. When we arrived at the beach I thought, ‘what?! why is it so dirty?’ Once we got close then I got stunned seeing the shiny black sand. The sparkly black sand and blue horizon will give you another level of indulgence. For the location just google, Kebun Bunga, Sanur, there you’ll find an empty field and a narrow road marking beach. Follow the road and you’ll find the Black Sand Beach of Bali. If you roam around the city you’ll see the whole city of Bali is adorned with gates and statues. you’ll find a lot of shops and places that make stone, wood, glass and sand sculpture. Those fine creation of sculpture surely blow your mind away and you’ll want them to bring back with you but those are huge to bring back hehe. If you want to get familiar with Balinese culture you must watch their cultural shows, have some local Balinese food. Nightlife is also happening part of the city but only in the beach area. Like Kuta beach or Seminyak area stays awake for pretty long. Some restaurant and clubs have the beach facing terrace, you can relax the with a drink. You can also discover the malls and local handicraft markets. Yes, it was a budget travel to Bali but we’re not backpacking either. So, getting some souvenir was a must. There were a lot of choices for souvenirs. I picked up a dream catcher (50,000IDR), a few fridge magnet(15,000IDR each), a couple of shell tray(30,000IDR) and as a makeup lover I also picked up some makeup. Apart from mesmerizing beaches, the island is also very popular for temples. There was also another twin waterfall that we wanted to visit. Lembongan island, dolphin spot were calling us so badly but we couldn’t manage time. Although we weren’t able to visit every possible spot, we did enjoy out Bali adventure to the fullest. Don’t forget to bargain for whatever you buy except the fixed priced mall/stores. We bought water bottles from 45,000IDR to 2500IDR. The asking price of the dream catcher was 250,000IDR and my husband was too shy to call 50,000IDR for that but ultimately without any word they sold it on 50K! Also if you book your hotel early, a month or so then you can get a cheaper rate. My Lasik Story | The Best Decision of My Life?! Hi Nadia, we randomly googled for car rentals in Bali and then contacted a few via their given number. Everyone has a different pricing for different cars. We agreed with them who matched our pricing. I’m sure you’ll enjoy your trip, Bali is beautiful. Bali looks stunning!! great views and these pictures capture the beauty of this beautiful place, love it!! I felt like my last working trip to Bali two years ago was just like tasting the tip of the iceberg! We only got the little time and chance to get off from our busy shooting schedule and visited Uluwatu, that was about it. We sure had a very memorable time of Bali and have always dreamt of going back there again one fine day! Such a nice one, I am looking forward to your next adventure capture here, dearie. Have a lovely weekend ahead! AM also loving the new look you are working on your blog, it’s getting better and better each time I come back and visit and read about your makeup and beauty discoveries. Keep it up, dearie. i visited ubud before and it’s such a lovely place! will definitely want to revisit bali again! I’m feeling sad that you burned your tickets for the rumor! I like the makeup tray! and I like how you composed it..hehehhe those are some really beautiful scenery!! Though I did notice there were few drawbacks for most of them :( but still hope you did enjoy your trip..probably next time can try finding out when it isnt the peak time for tourists? WOW!!! The views are absolutely breath taking! Oh how I would love to take a vacation. Lovely vacation never been to Bali but would love to go visit in the near future. I sure need a vacation though hopefully soon. Loved all your pictures they where all beautifully taken and they shows us the beauty of nature. Glad you enjoyed your vacation and it sure looks like you had tons of fun!! I have the same stone necklace and get so many compliments for it! Your post is amazing! I have been to Bali so many times, but never to Blue Point Beach, Green Bowl and Nyang Nyang Beach. They look amazing! I will have to check it out on my next trip. It looks like you had a lovely trip. Reading your post and it gives me a real urge to visit! Gorgeous pictures and sharing! Wow it seems like you have explore so much in Bali! Some places that I never been to when I was there .. I really want to go to Bali one day! It looks so beautiful there. Maybe for my future honeymoon, haha. The beach looks awesome. I want to visit there too. What a beautiful places that you went. what is camera that you using ? all the photos look awesome ! Elysium Brushes | Are they worth giving a try?